Diverse Wilderness Experiences in "The Frank"
“Thanks so much for all you guys do! Can I get you a beer as a way of saying thanks?” Sitting chest deep in a 104 degree hot spring pool, I politely declined the offer from our new friend, who had rafted in with about twenty of her friends earlier that afternoon. Anyways, my belly was still full from the pulled pork and baked beans we had for dinner. I sank deeper into the pool until the warm, mineral-rich water washed over my whole body, exhaled, and reflected on my experience working along the Middle Fork of the Salmon River. When I think of “capital W” Wilderness, I think of solitude, silence, challenges, hunger, and sore muscles. However, this hitch didn’t include very much of those things. Although we were camped seven rugged miles past the Wilderness boundary, I felt at many times that I was living in luxury in the Frank’s equivalent of the Hilton. 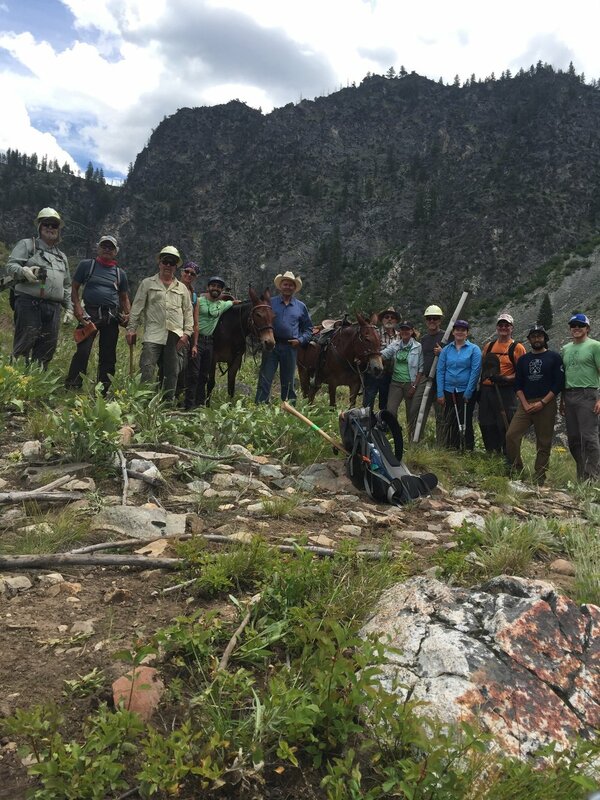 We had stock support from the Treasure Valley Backcountry Horsemen—we didn’t have to carry most of our gear, and all our food (including perishables like meat, eggs, and produce!) was carried and prepared by these wonderful people. Not including the thirteen people in our group of volunteers and SBFC employees, I probably saw anywhere from thirty to fifty new people each day rafting the Wild and Scenic Middle Fork of the Salmon River parallel to the trail we were working on. Additionally, with camp being nestled between multiple busy backcountry airstrips, I got accustomed to the seemingly-constant buzz of the propellers of low-flying airplanes during this hitch. As if we didn’t have it easy enough already, blue skies and sun smiled upon us each day of the hitch, keeping us dry, energized, and positive! On the last day of trail work, the group made it to Joe Bump Cabin—a remnant of a pre-Wilderness time when people had tried to domesticate the Frank and extract resources from it. How did they survive out here? A little further down the trail, a grave marked, “Elmer ‘Set-Trigger’ Purcell, prospector-trapper, Died 1936” reminded me of the posterity of the challenges, ruggedness, and wildness of this place. This hitch was a great reminder of the social aspect of Wilderness. While I do enjoy solitude and self-reliance, I also enjoyed seeing the way this place brought people together in ways that aren’t easy to come by in the front country. I loved the sights and experiences I was able to enjoy, but they were not mine alone to behold. This public land was designated for everybody to experience. 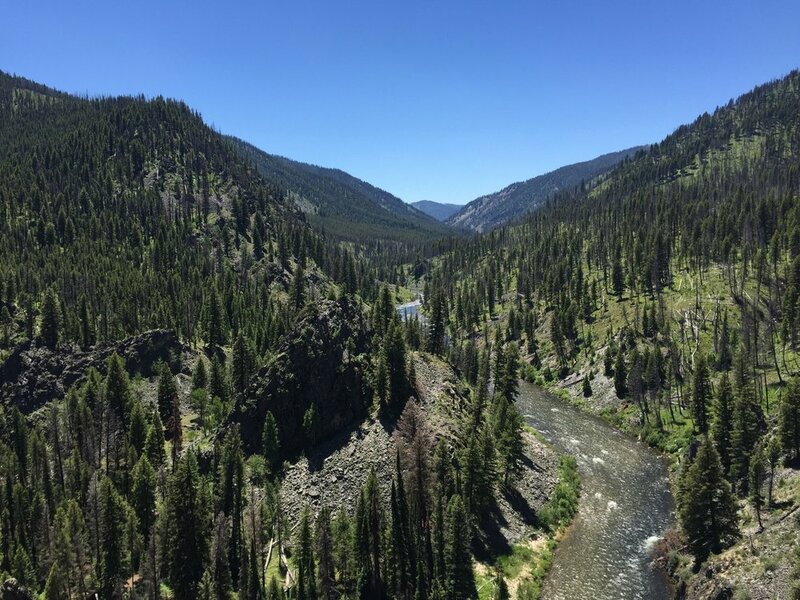 Whether you’re in your teens or your eighties, this unique area allowed opportunities for all different kinds of people to immerse themselves in Wilderness in many different ways. Wilderness experiences in the Frank can be as diverse as the ever-changing landscape. The group posed for a picture while taking a mid-afternoon snack break. Pictured from left to right: Steve, John, Larry, Betty, Josh, Bill, Keith, Sally, Howard, Allison, Dave, Ben, Zach. Looking up the River of No Return from a rocky point above the river. 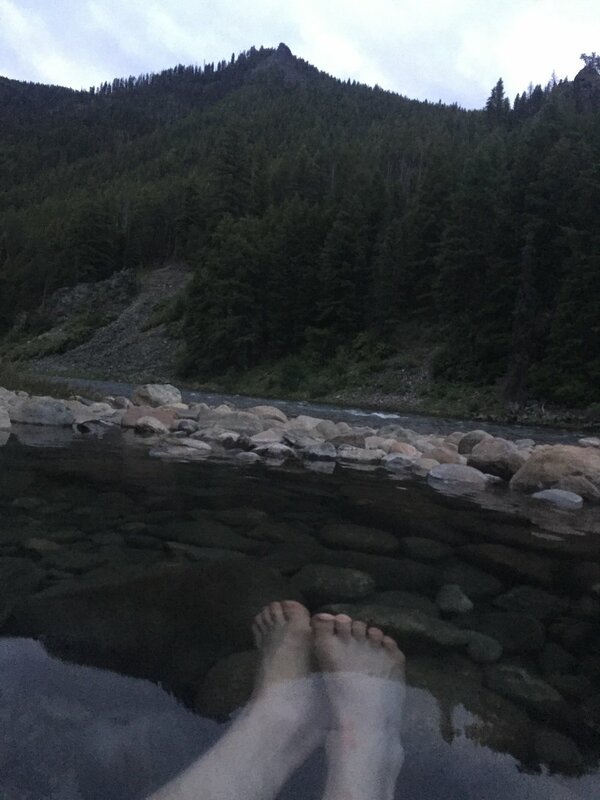 I woke up at 5:00 one morning for a sunrise soak in the hot spring pool near camp.